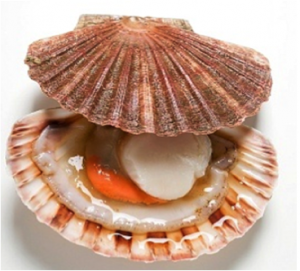 Scallop (Pecten novaezelandiae) | Wildfish Export Ltd. Description: Scallops are found around the coast in the sandbanks and mudbanks of sheltered bays from the low tide mark out to about 50 metres depth. They lie on the seabed with the flat shell uppermost, often singly but sometimes grouped in beds. 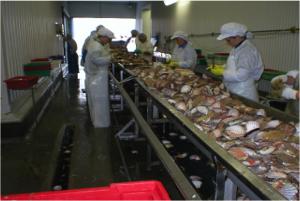 The main dredging areas are Tasman Bay and Golden Bay, Marlborough Sounds, Coromandel coasts, and Northland coasts. They are best harvested before they spawn in the spring and early summer. New Zealand’s Scallop fishery is managed by strict quotas, which allow only a set amount of Scallop to be taken commercially each year. Other names: Maori name: Tupa, New Zealand: Scallop, The Netherlands: Grote mantel, Germany: Kamm-Muschel, Greece: Cteni, Italy: Ventaglio, Japan: Hotatega, Spain: Vieira. Meat Quality: Scallop flesh is firm & white and the roe is usually bright orange.